Pierre Loti neighborhood was built in the sixties. Located at the entrance of Aytré, a suburb of La Rochelle, along the main road called Général de Gaulle Avenue, the neighborhood enjoys a large visibility. Today, it is the target of an urban renewal project. Thus, architectural as well as urban stakes are big. The aim is to participate in the construction of the neighborhood’s new identity, regarding its rich social history and strategic location. Several projects are already achieved, contributing to start transforming the area. 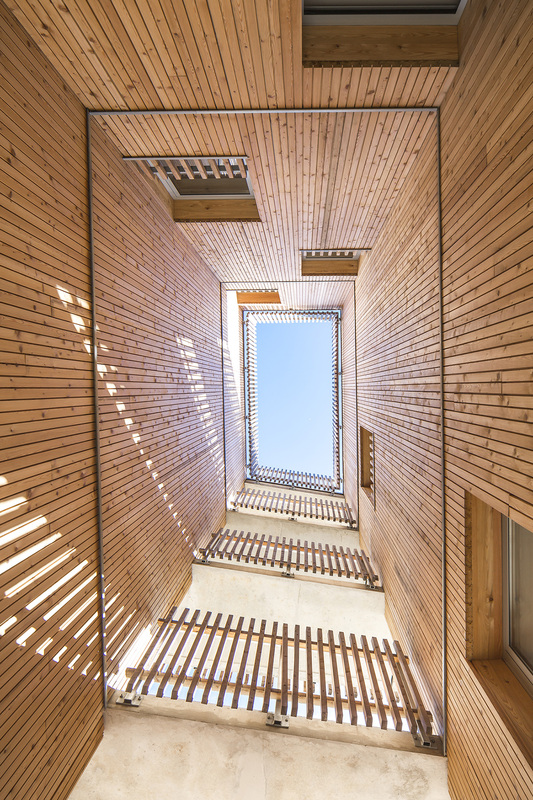 This 64 dwellings project, divided into two buildings, is implemented in the heart of the residence Pierre Loti, completing an urban renewal. The master plan places the project at a crossroads of varied building types and densities. As a consequence, the process aims for a volumetric transition, possible within the context, contributing to the future identity of the new Pierre Loti Street. -On one hand, the R building, through the shape of its roof, floors’ movements (R+4 on the Charles de Gaulle Avenue, R+5 in the center, and R+3 on Pierre Loti street) and volumes’ gradual transition, assures a new link toward Aytré city center. -On its part, the S building facing the most imposing form of the Galapagos building, offers in response a more compacted monolithic volume. The two constructions offer to the passerby sequenced facades: horizontally with long terraces and vertically with entrances and vertical flows inside the buildings, designed as rifts. The project highlights ideas of appropriation and habitability, with a wish of giving to each dwelling a nearly private access. The treatment of the side spaces in connection to the Pierre Loti Street and following on from the buildings, fits in with the latter outline. 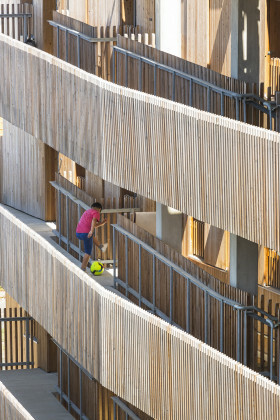 Regarding the R building, the path reinterprets features of individual housing into the apartment block: passing through a fence, pushing a barrier, following an alley, taking advantage of the landscape and entering the dwelling through a door directly open to the outside. Outdoor corridors allow an aerial walk, offer numerous views and support neighborly relations. Besides, they enable the dwellings to be dual-aspect, to benefit from double or triple orientation, and preserve privacy. 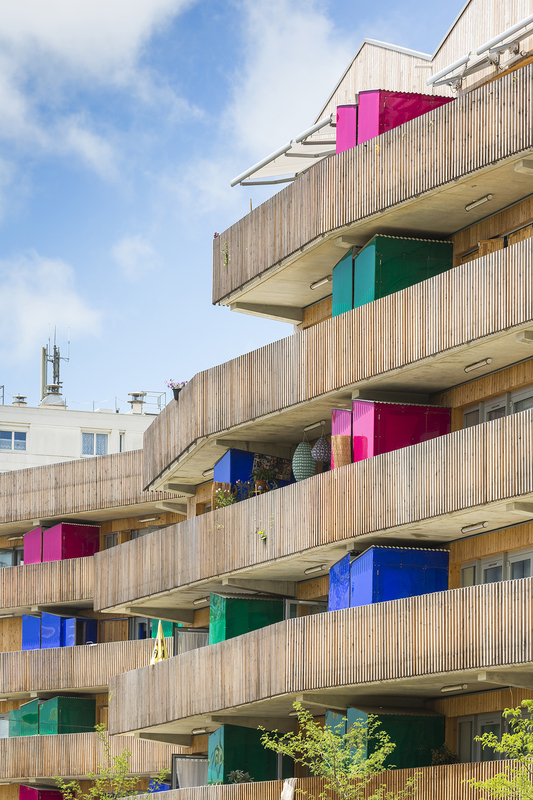 They lead to only 6 dwellings per floor. These "pontoons" establish a gradual distance between public and private spaces. 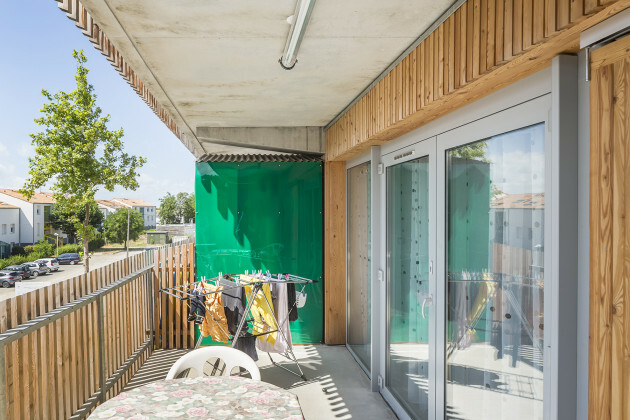 In addition, displaced accesses to the entrances preserve the dwellings’ intimacy from the traffic. The outdoor corridors give access to the dwellings thanks to private footbridges. 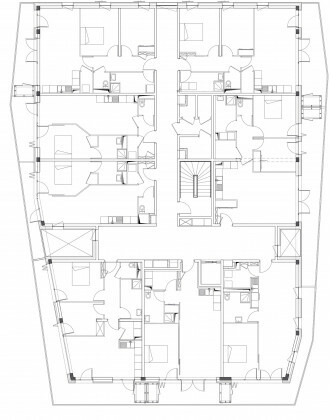 Concerning the S building, the density of the construction and the efficiency of the distribution (8 dwellings per floor) implies a precise work regarding natural light input in each space, and especially in the communal areas. The path invented for the residents starts in a dual-aspect hall, north-south oriented, completed with a north-western fragment. This cutting up in the building allows the creation of clear views toward north, south and west, in shared spaces bathed in light. Generously glazed facades, protected by the terraces, show the indoor spaces’ quality and the elaborated relation between inside and outside. Each dwelling becomes a belvedere. The landscape takes entirely part in the project and participates directly to the qualities of private and communal areas. 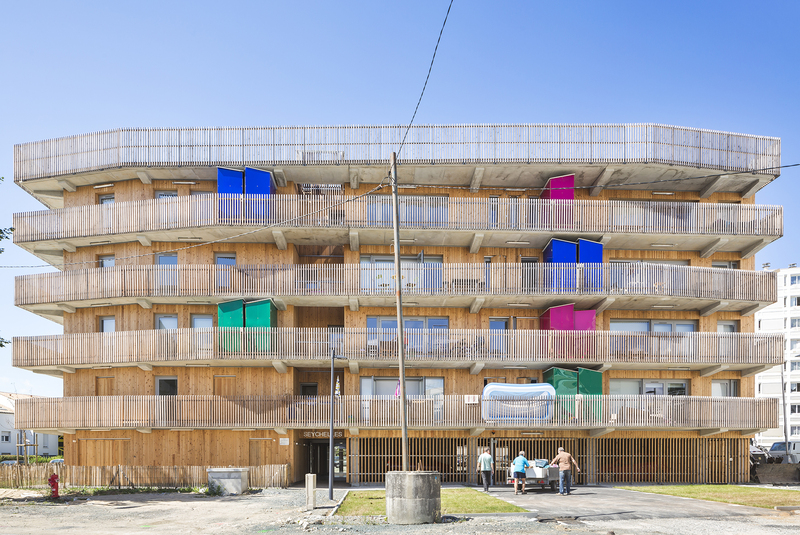 On the ground floor, the dwellings are accessible trough individualized entrances and an enclosed private garden, with a direct way out to the orchard (R building) or to the urban incubator (S building).The five-roomed apartments are organized as duplex, giving to the dwellings a real shape of detached house. Firstly, the dwellings were thought and conceived from the inside, in relation to the surrounding nature. Every dwellings are dual-aspect or double oriented (depending on R or S), and each space designed to benefit from natural lighting and views. -a nighttime part contains bedrooms and damp rooms. 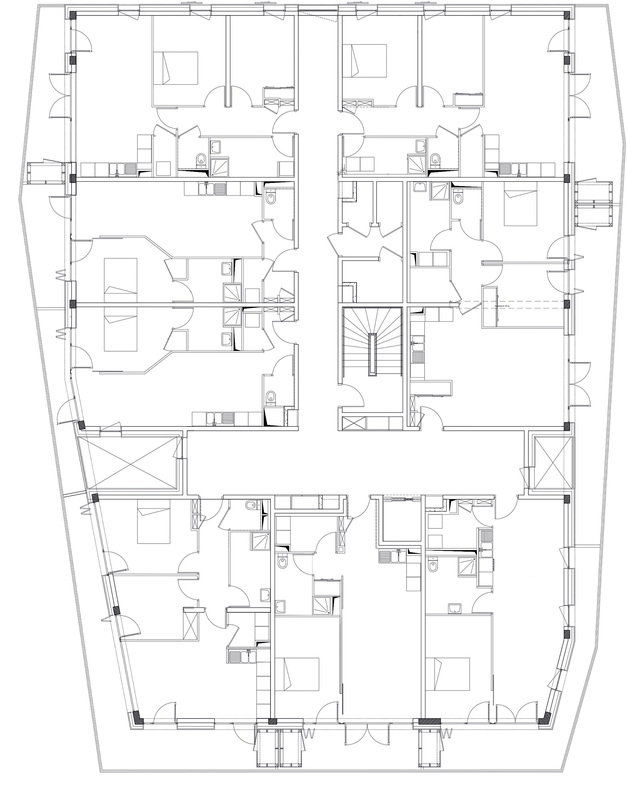 Dwellings’ dimensions enable to imagine sequenced interior arrangements in order to identify them. Therefore, permutations are possible between the kitchen, storeroom, living room, dining room... This length offers linear walls giving more leeway to the tenants to organize their furniture. 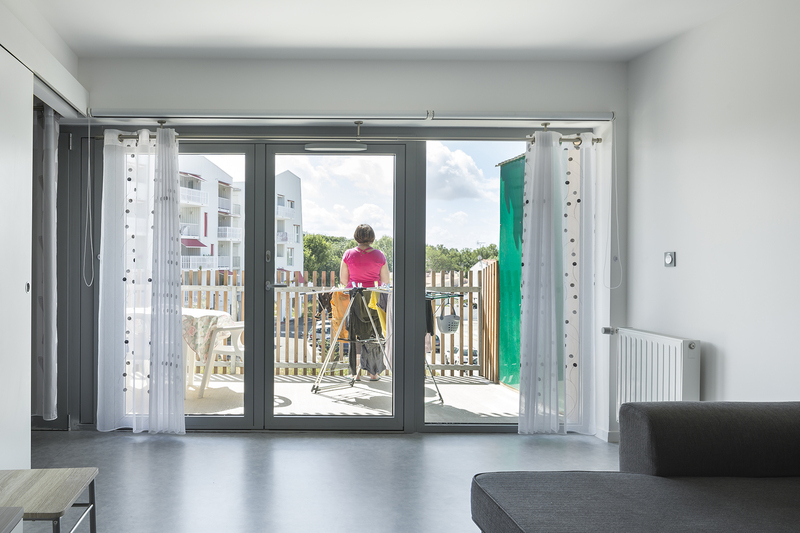 Finally, the length, the outdoor corridors and the optimized entrance of each dwelling contribute to reduce inside circulations and increase day spaces. 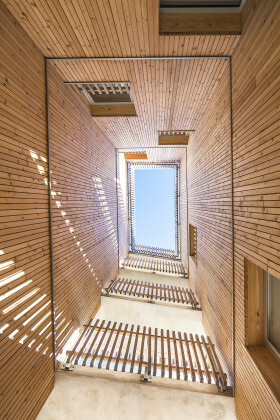 The buildings, flows and skylights are enveloped into a natural Larch wood skin, with facades covered with solid slats and handrails made of openwork rafters, placed in an alternate rhythm. This enables to reduce linearity, to break with plan facades’ uniformity and to slice the buildings into flowing sequences. Thus, the skin offers a chromatic vibration of the facades and suggests thickness. 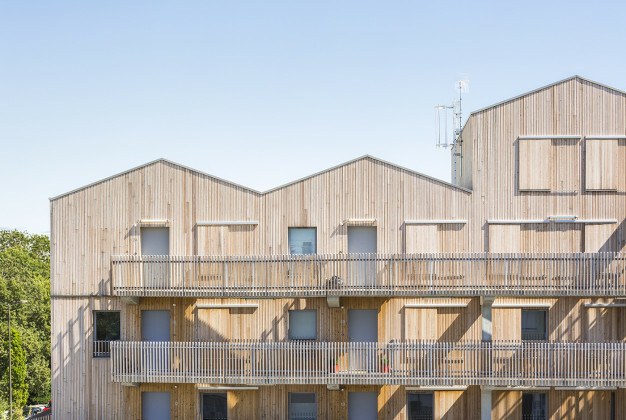 Wooden cladding and handrails contribute to highlight the site, inasmuch as this material brings undeniably visual comfort, with its texture and tint. This formal intent, besides its impact, embodies the urban renewal program of the neighborhood on the scale of the intervention. This fits with the wish of successful environmental integration, at the heart of a defined environment spreading garden imaginary. 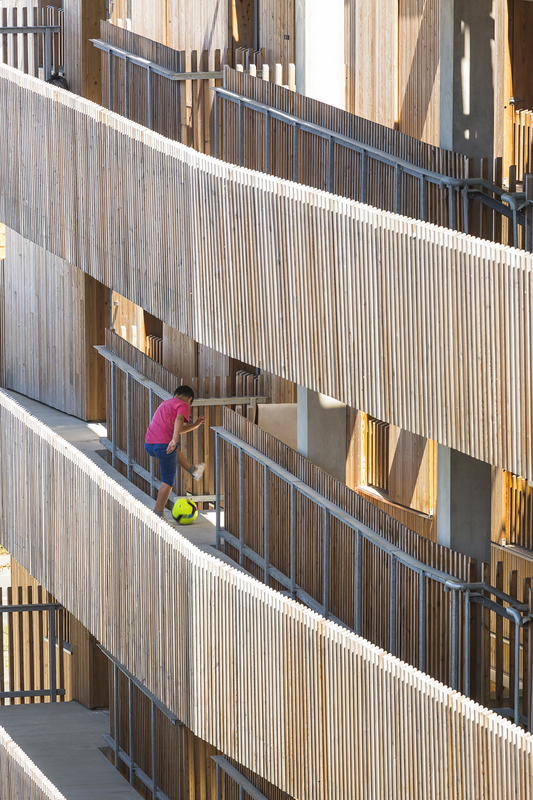 Additional spaces are defined according to the same philosophy: these elements are made of vertical openwork wooden fences and covered with polycarbonate. The suggested atmosphere fits in with this natural environment. 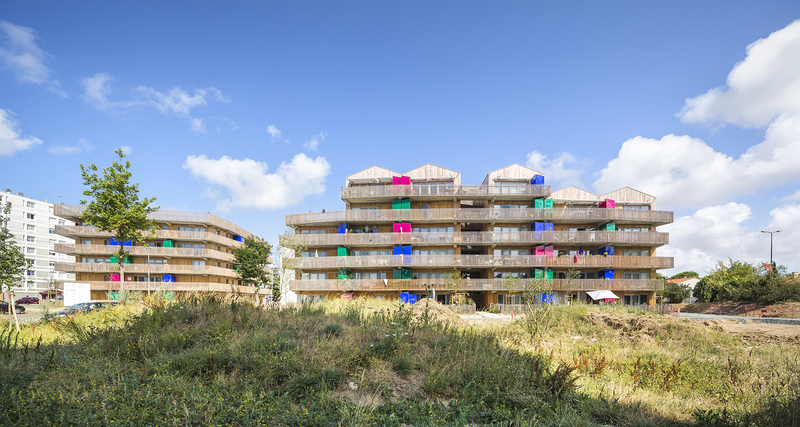 Each dwelling has a shed / storage unit on its balcony, made of colored polycarbonate that animates the facade and separate dwellings. At ground level, the ubiquitous vegetation visually connects communal (urban incubator) and private spaces (gardens and/or terraces). Communal gardens established on the R building’s roof extend this phenomenon vertically. -North southern orientation for every dwelling (R building). Include the site’s climatic features: wind, sun, and topography. Optimize the living areas’ exposure (R and S buildings). Protect exposed facades passively with terraces’ eaves. -Density and simplicity of the buildings and dwellings’ shape. 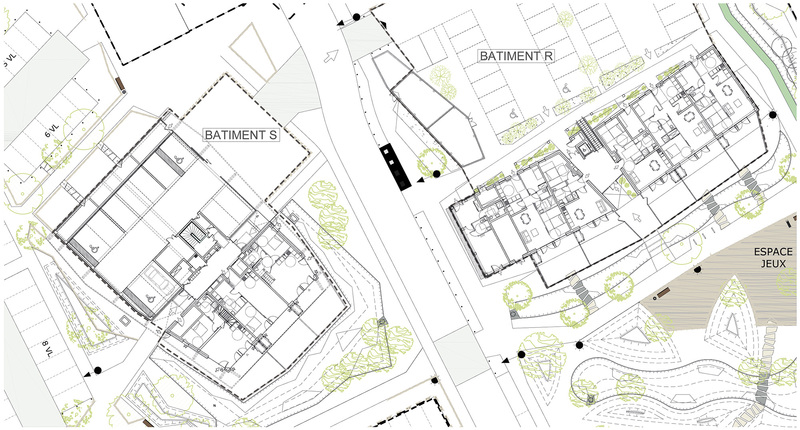 -Communal outdoor corridors and individualized access on the northern facade. Solar southern facades largely opened on the private terraces (R building). -Simple concrete structure and external isolation, guaranteeing an efficient soundproofing in addition to a performing thermal inertia necessary to summer comfort. 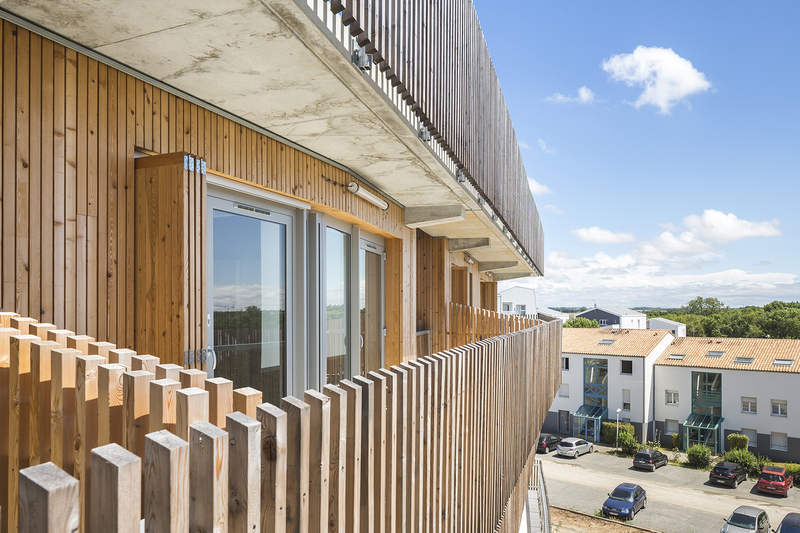 -Natural ventilation, dual-aspect dwellings (R building) or apartments located in corners (S building) and therefore benefit from a double or triple orientation. -Reinforced external insulation and treatment of the heat bridges. -Production of hot sanitary water by solar panels. -Rainwater collection to maintain outdoor communal spaces and individual gardens on the ground floor. 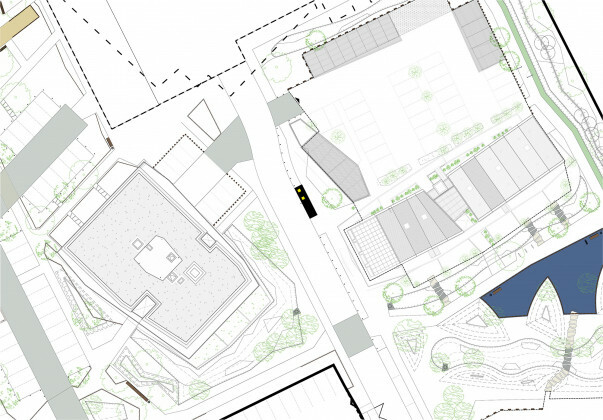 -Aerial parking lots and shared bike sheds. The conception of outdoor spaces comes under the same philosophy. Indeed, waterproof surfaces are restrained and natural topography respected in order to create natural water absorption. In addition, planted streams avoid expensive buried networks and highlight the landscape.